It isn't often that you will find a factory fresh car for sale. Not a freshened car, or even a low mile example, but a car that was never registered for the street and has been stored since it left the dealer's lot...in 1987. The only catch — you've got to buy all four. Mix in one part Texas cowboy named Carroll Shelby and you got a recipe for gold...multiply it by four and you've got today's next feature. Find these 4 factory fresh Shelbys, each allegedly the first car available to dealers (vin #6): 1987 Shelby CSX, 1989 Shelby CSX, 1987 Shelby Lancer, and 1989 Shelby Dakota offered here on eBay for $120,000 or make offer located in Pennsville, NJ with 4 days to go. For sale are 4..... Yes 4 BRAND NEW Shelby vehicles. All 4 cars are still under original Shelby MSOs. All purchased from original dealer and kept in temp controlled dry storage since day 1. All dealer markings, plastic on seats, only approx. 25 miles on each car. Brand new cars still look and smell like they did in the dealership over 25 years ago. 2 Shelby CSX's (a black 87 and a red 89), 1 87 red Shelby Lancer, and an 89 Shelby Dakota (also in red). All cars are #6 of these limited edition numbered Shelby's. Dealership had agreement to get the first ones available to the public and these are it!!! First up is this 1987 Shelby Lancer, which was based on Dodge's compact Lancer 5 door hatchback (yes a Chrysler K-platform car!!) but assembled by Carroll Shelby's technicians in his Whittier, CA plant. Please don't confuse it with the later (1988-89) Dodge Lancer Shelby - which was built the following year by Chrysler in its Sterling Heights, MI Dodge plant. This thing looks like it just got off the delivery truck in 1987 and is complete with factory window sticker. The photos are low resolution and don't show too many details, but how many pictures of a 25 mile car stored in a climate controlled garage do you need to see? Next up is a 1987 Shelby CSX that is also fresh from the factory floor. Shelby started acquiring incomplete Dodge Shadows to turn into his CSX - short for "Carroll Shelby eXperimental." The Shelby version included a high power engine, stiffer springs/shocks, Shelby specific interior and Shelby fiberglass composite wheels. Power comes from the Turbo II, a version of Chrysler's 2.2 liter inline-4 cylinder turbocharged and intercooled engine - putting out 175 horsepower and 175 ft-lbs of torque. This next museum piece is also a Shelby CSX, but this one comes from 1989. I can't imagine that a factory fresh Dodge Shadow or Plymouth Sundance could demand much more than a few grand, but the Shelby name brings out the boys with fat wallets. If you could peek inside this CSX, you would see seats and doors covered in Shelby script. 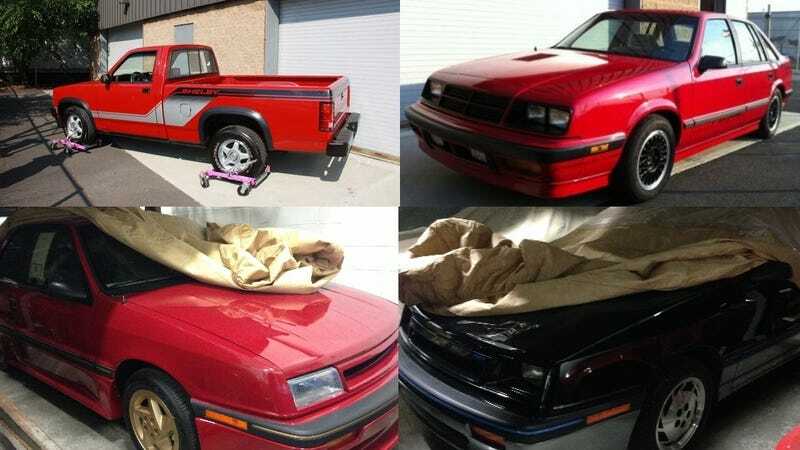 Seems strange that the seller doesn't take the car covers entirely off for the pictures, but who is going to second judge anyone who buys brand new cars and parks them for 27 years. The seller was nice enough to roll the final car out into the sun for pictures — but the use of 4 wheel castors reduces the possibility of adding a click to the 10ths digit on the odo. This is a 1989 Dodge Shelby Dakota pickup, the ornery Texan's first rear-wheel drive car in a number of years since he joined Chrysler and put his name on a bunch of front-wheel-drive hatchbacks. Originally posted as Brand New: Shelby '87 CSX, '89 CSX, '87 Lancer, '89 Dakota on Daily Turismo. Image credits; Shelby, eBay. Hat tip to GreenN_Gold on oppositelock.